There are many varieties of gourd that are grown here in Thailand. Here we offer a selection. Fresh Ivy Gourd Seeds alternatively known as Pak Tum Lung. Easily found and well grown in gardens or on fences. Tips are blanched for dipping with chilli, fried, and cooked as clear soup. General characteristic Vines with small green and round tendrils. The tendrils are 12-14 cm long, single and spring-like twisted, oppositely inserted to leaves. Leaves are simple and alternate. Leaves' bases are in heart-shaped, sharpened tip and curvy edge. The shape of the leaf is star-liked with 5 rays. 5-7 veins separated from leaves' bases. Leaves are 3-4 cm wide, 5-6 cm long. A stem is 3-5 cm long. Flowers are solitary, axillary, and sometimes fasciculate. Berry-like fruits are green when young and red when ripe. Inflorescence is during April-December. Fruiting during June-January. Propagating by seeds and preserved stems. Sow seeds in moist and warm (27 °C / 80 F) slight acid soil. Grow Up a trellis like used for melons. 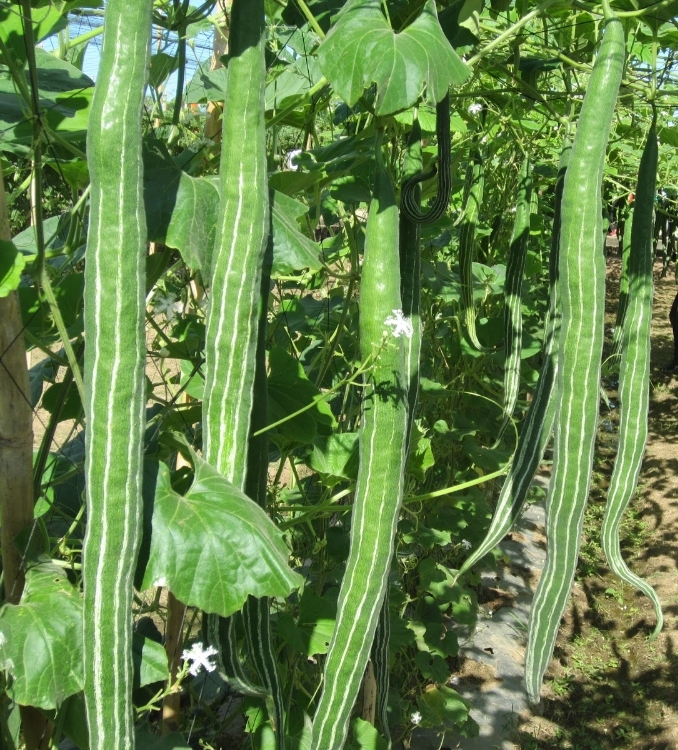 The snake gourd can reach lengths of up to 7 feet in ideal conditions! 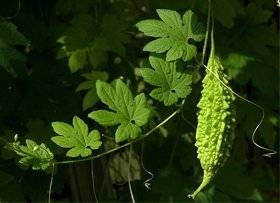 Young fruits are harvested and cooked like (Loofah) Luffa. Delicious when sliced up in dish with egg. Plant in a Sandy Loam to Clay Loam in full sun. Bitter gourd is generally consumed cooked in the green or early yellowing stage. The young shoots and leaves of the bitter gourd may also be eaten as greens. Bitter gourd gourd is often used in Thai and Chinese cooking for its bitter flavour, typically in curries, stir-fries, soups, and also as tea. 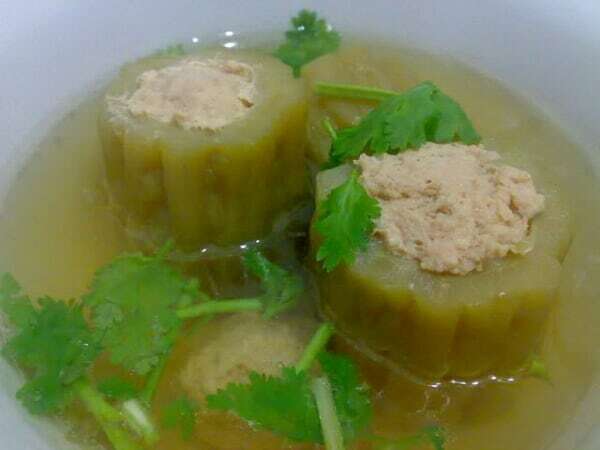 Here in Thailand it is often stuffed with spiced minced pork and is served in soups. It is very popular throughout South Asia. In North India, it is often prepared with potatoes and served with yogurt on the side to offset the bitterness, or used in sabji. In Punjabi cuisine is stuffed with spices and then fried in oil. In Southern India it is used in the dishes thoran/thuvaran (mixed with grated coconut), theeyal (cooked with roasted coconut) and pachadi (which is considered a medicinal food for diabetics). Other popular recipes include preparations with curry, deep fried with peanuts or other ground nuts. 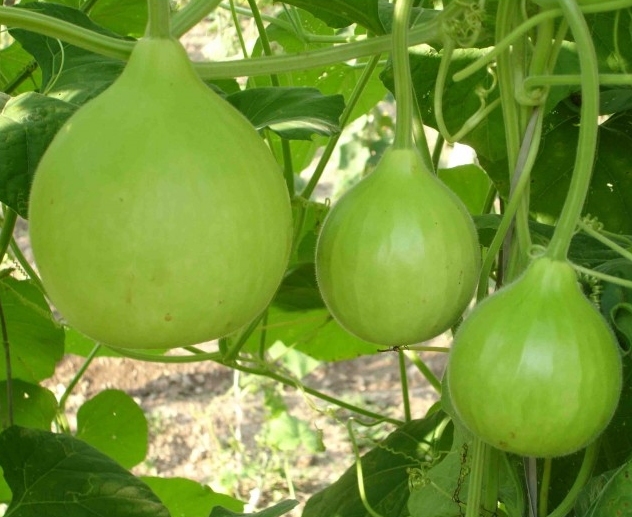 The Round Gourd, also called Indian Round Gourd or Apple Gourd or Indian Baby Pumpkin, is a squash-like cucurbit grown for its immature fruit, a vegetable especially popular in South Asia. It is the only member of the genus Praecitrullus. 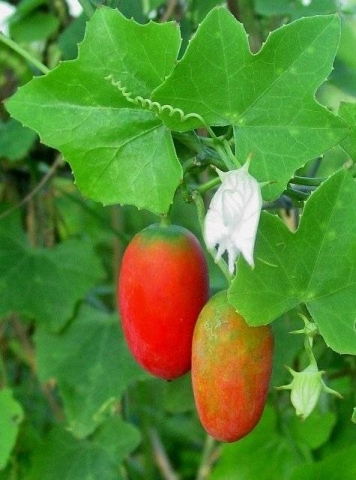 The plant is, as with all cucurbits, a prolific vine, and is grown as an annual. The fruit is approximately spherical, and 5–8 cm in diameter. The seeds may also be roasted and eaten. Tinda is a famous nickname among punjabi families in India. This unique squash-like gourd is native to India but grown also in Thailand, very popular in Indian and Thai cooking with curry. Green coloured, apple sized fruits are flattish round in shape and 50-60 grams in weight. Plants are vigorous, productive and begin to bear fruits in 70 days after planting.